What terminology is important in brain anatomy? Although we will try to stick to plain English in this book, it is useful to know the basic terminology used in the discussion of brain anatomy. As the brain is a three-dimensional structure, specific terms are used to distinguish up from down, back from front, and inside from outside. The terms anterior and posterior are used to refer to front and back, respectively, as are the Latin words rostral and caudal. Superior and inferior refer to top and bottom, respectively, as do the Latin words dorsal and ventral. 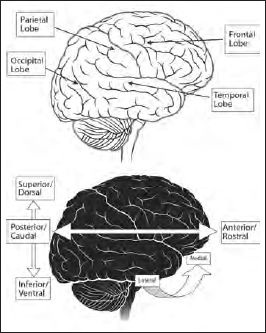 Lateral refers to outside, while medial refers to the inside. Lateral view of the brain (iStock).